Another Super Bowl? The fifth in 11 years? Darkest days Best days of the franchise indeed. They’re more enjoyable too without a 18-0 record hanging over them. We made Pretzels for the Eagles game, and reused the recipe to make pretzel rolls for the Colts game. This time, we’ll make smaller rolls. Same prep and ingredients as seen here. Divide into 12 equal parts and roll each into a ball. Boil in a baking soda and water solution as laid out in that buffet table, but for a minute per roll instead of 45 seconds. Place on a cookie sheet lined with parchment paper and sprinkle with pretzel salt, or kosher salt if you can’t find pretzel salt. Bake the pretzel rolls for 15-20 minutes at 350 degrees. Remove to cooling rack, and once cool keep in a paper bag for the next day. Double or triple the recipe from the Philly game as necessary. A change from the usual crab cake. I’ve added a bit of frozen corn to the mixture, and even some chopped jalapeno for a kick. In a Dutch oven or frying-like contraption, heat oil to 350 degrees F.
In a large bowl, combine cornmeal, flour, thyme, baking powder, salt, garlic pepper, baking soda and cayenne pepper. In a small bowl, combine eggs, buttermilk, and sour cream. Add to cornmeal mixture, stirring just until dry ingredients are moistened. Fold in onions, bacon, and crabmeat. Dip spoon into water and then a spoonful of the hushpuppy mixture. Drop by tablespoonfuls into hot oil, and fry until golden brown. Drain on paper towels. You should be able to fit 2 on each slider bun. 1.5 lbs. thinly sliced ribeye steak purchased from a Korean market. You can slice your own ribeye across the grain in thin slices. Freezing the beef for about an hour helps to cut clean slices. Combine all ingredients except beef and onions in a bowl. When the sugar has dissolved, add beef and onion slices and stir to coat. Refrigerate for at least 1 hour. As the beef is cut so thinly this does not need multiple hours or overnight to marinade. Cook directly over high heat, keep an eye on it as it will cook very quickly. Combine egg, beer, bread crumbs, caraway, marjoram, garlic, salt, pepper. Add the veal and pork. Form into twelve patties. Cook over high heat for 3 minutes, flip, cook an addition 1 minute and check for doneness. Coat the bun with German mustard, top the burger with sauerkraut, and eat. Pretzels, Pork, Cow, Crab: All food groups accounted for except one … beer. We’re going with Spring Seasonals, the only beer season that we haven’t covered before. Spring already? Yes in the beer world, this term is being stretched well into winter. Some of these are called a far more accurate late winter seasonals. Most of these are available now and some will trickle into stores over the next few weeks. Styles do vary, most of the older ones were sort of lighter versions of a winter beer. The newer ones tend to be more of heavier summer beers. Many are Irish Red ales, as this is the season when Saint Patrick’s day falls. From New York, the Sixpoint brewery started distributing to New England just a few months ago. Their Spring seasonal is Resin, a Double IPA. 9%+ ABV, 100+ IBUs and good. Unlike their standards and previous 2 seasonals this one is in a 12 ounce can instead of a 16, owing to the ABV. Still in 4 packs for around $10. Representing Baltimore we turn to an old favorite Heavy Seas, formerly Clipper City. They have a strong seasonal lineup. 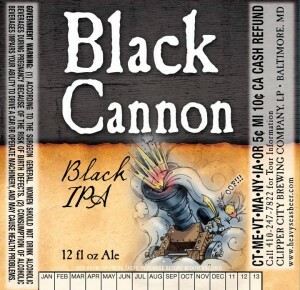 In the Pyrate Fleet of 7% and above beers is Black Cannon Black IPA. A darker, 7.25% version of their Loose Cannon IPA. In their Mutiny Fleet of really big beers is Siren Noire. Holding Fast to the Late Winter instead of Early Spring tradition with this 8% Chocolate Imperial Stout. with oysters. Oysters were cheap and often used as a free bar food in the Nineteenth century. 4.7% and actually available for half the year as Clipper City only runs 2 six month long seasonals for the Clipper Fleet line. Sam Adams, Sierra Nevada and Dogfish Head have all introduced new spring seasonals. Sam Noble Pils goes to year round status, and in it’s place as a seasonal is Alpine Spring. In the kellerbier style, similar to an unfiltered Pilsner. Very crisp and easy to drink. This is also the time of year that Sierra Nevada puts out Bigfoot. 9.6% ABV hoppy American style Barleywine. Dogfish Head goes the gluten free route with Tweason’ale. At 6% ABV and no gluten, these beers tend to be very thin and not beer like but worth it for those with gluten allergies. It is coming out for the first time this “spring”, but they’ll release it every few months after this. This is also a traditional time for Bock beers, and there are a few available as seasonals. Representing the Patriots other playoff opponent Denver is Breckenridge with their Pandora’s Bock. This one pushes the line between a Bock and Doppelbock at 7.5% ABV. Anchor Bock has been a February release, but with so many others moving Spring to January we’ll see how long that lasts. It’s 5.5% and rich, dark color puts it firmly into the Traditional Bock style. St. Boisterous, a 7.3% Helles Bock. Helles Bock being an even lighter version of Mai Bock. Paper City Goat’s Peak Bock is a 6.4% ABV traditional Bock. Otter Creek Mud Bock is back after a hiatus. At 5.7% it’s on the low side and amoung the lowest alcohol bocks listed here. It isn’t showing on the website yet, because Otter Creek updates their website very slowly. Berkshire Raspberry Barleywine is a 9%ABV strong ale brewed with Raspberries. Not the typical fruit beer. Harpoon Celtic formerly known as Hibernian is a 5.4% caramelly Irish Red Ale. In the 100 Barrel series is 100 Barrel Black IPA a 7% ABV citrusy and piney IPA. Magic Hat Spring IPA Demo Black IPA is another Black IPA and their seasonal IPA. +/- or “plus minus” is their other seasonal, a 4.2% Dark Mild. Founder’s Double Trouble is a big 9.4% 80+ IBU Double IPA. Get it while supplies last. Wormtown goes the Irish Red route with .. Irish Red. They also just brewed a White IPA after last week’s list of White IPAs was written. Jack’s Abby Hey Diddle Diddle Double India Amber Lager is their second Double IPL. 8% ABV, over 80 IBUs and amber in color. Framinghammer Baltic Porter will also be released before the 5th. It’s a 10% Baltic Porter, so sip don’t gulp. Boulevard Chocolate Ale is a dark, 9.1% ABV beer brewed with chocolate. Longtrail goes with the golden pale ale Pollenator. Only 4.6% ABV so you can drink a bunch of them. Lagunitas Imperial Red is a big, 7.6% Amber ale in the strong and hoppy west coast style. Not to be confused with the typical gateway amber ale. It won’t be available until February but probably the best Spring Seasonal is Troeg’s Nugget Nectar. 7.5% and 90+ IBUs of pure deliciousness. It’s their HopBack Amber taken up to 11. Mayflower Spring Hop in some ways is similar to the previous two, being a hoppier than normal amber ale. Spring Hop however is a more drinkable 5.3% ABV without cutting out any of the hop aroma.